I have now added Poetic Art Hoodies to the Studio`s wearable art collection. 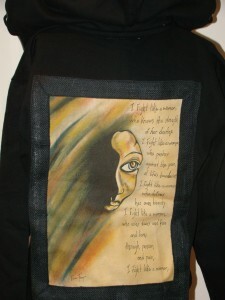 Each hoodie has a unique, canvas art piece on the back which is framed with black burlap to give it a framed affect. The hoodies are available in black and come in sizes S-XXL. One of the main questions that clients have is: `does it wash well?`. The answer is `yes`. I have personally done wash tests on all of the wearable art to ensure that each piece stands up well after multiple washes. With that being said, there are special handling instructions for each wearable art piece to ensure that it is well maintained for years to come.